Actually, Enishi's character does develop this episode - he demonstrates a sense of responsibility for his actions. That's generally a well respected trait, probably even more so in Japan then the west. The problem is that it gets overshadowed by the pool scene, which hams up his pathetic side. (The scam is also too obvious to the audience, although that's a relatively minor issue from my perspective). I can understand what they were going for... But when you have a very unsympathetic character (For me and many others at this point) going around failing the entire series with his little ideas the whole time, and then in an arc devoted him to him exclusively have him fail once more on an even grander scale... It just paints his character as utterly incompetent, and he is further overwhelmed by the female cast around him. In the end, he took responsibility for failing yet again, but what am I supposed to take from this? Cool he went on a wild goose chase and was man enough to admit he screwed up. So is the lesson that he should never do anything again? That he should always be on the side lines? I mean I don't get what the point of this arc was. I don't felt it did good for his character, rather it was just the opposite. Basically the plot only occurs because the cast is retarded. I suppose I could buy that though; but I don't find value in storytelling when I have to turn off my brain. It doesn't sound like my love is getting to you. More passion than hope, much deeper than despair.... Love! I wasn't a fan of this episode either, but I don't think it was lacking a message or a purpose. The most predictable way to show growth in Enishi's character would have been to have him succeed at something big. The message there being that the ablility to take charge and succeed is the barometer of personal worth and maturity. Instead, the episode suggested that the way you deal with failure is more reflective of character than your ability to create success. That's actually an interesting take on Enishi's and Takako's characters that I wasn't expecting. I'd tend to interpret the arc as stressing the importance of responsibility and due deligence - especially in "too good to be true" situations. That's what get Enishi into trouble: the idea of the inn being promoted via a movie is pretty sound on the surface(in contrast to the ideas he had earlier in the show), but he wasn't careful and got fleeced. I do find it interesting that his mom didn't step in, indicating that she may have wanted to see him take the hit. She actually seems to respect him a little more afterwards. And of course, as mentioned earlier I expect that the events here (the lost money in particular) may play a role later in the show. Actually, I like Kagayaki's interpretation is better than mine. I think he nailed it. I guess I should rephrase myself. Yes, he took responsibility and this shows strength of character for him. But other than the ability to man up, what else does Enishi got going for him? He's a failure at everything he does and his sister is far better than him. They ham fisted this point really hard, plus having him act like a bumbingly fool around Takako didn't help either. Basically, strength of character isn't worth much when you walk in foolishly into the mistake in the first place, and have a history of incompetence on these matters. You can own up to your actions when they fall through, but if your actions are always wrong... So what? If he was owning up to his failure after being rather successful with other things, the point would've been far better IMO. I have cared so little about the last two episodes that my anticipation for the Nako arc has shot through the roof. I hope her arc doesn't get ruined for me by the crappiness of this arc. @Reckoner: Yeah, Enishi doesn't really have anything else going for him, and what you pointed out (that he walked so foolishly into the mistake) may or may not have been the main flaw in how they tried to execute Enishi's character growth. I'll have to think about that some more, since I'm not sure where exactly his character went wrong. So I agree with you that Enishi is not the most compelling character, but I don't think it's because he fails at everything, including business savvy and common sense. I don't think you have to be good or even halfway decent at anything at all to be a good character in a story. You can probably think of at least one protagonist you like who falls into this category: http://tvtropes.org/pmwiki/pmwiki.php/Main/FailureHero. And it's not like you could take every character from that category and make them good/better at something and suddenly they'd be more compelling. There's something else at work here. So I agree with you that Enishi is not the most compelling character, but I don't think it's because he fails at everything, including business savvy and common sense. I don't think you have to be good or even halfway decent at anything at all to be a good character in a story. You can probably find at least one protagonist you like on here: http://tvtropes.org/pmwiki/pmwiki.php/Main/FailureHero. And it's not like you could take the characters from that list and make them good/better at something and suddenly they'd be more compelling. There's something else at work here. I agree that you can be a failure or lack redeeming qualities to be a decent character. Ano Hana is a good example of having pitiful characters that work. But at the very least he needs to gain some kind of empathy from the audience. It's kinda like, why should we care about him for being a failure. He pretty much brought it upon himself. Another sign of a character is a good conflict. Yet, from the conclusion we get, that in no shape or form really solves any conflict internal or external. The main problem is that the anime phoned home to us that he is too much of a fail to run the inn, giving someone else an excuse to inherit the inn. But... that's nothing we didn't know already. We knew he was a bumbling idiot that gets cheated a lot. In fact, you could have compressed these 2 episodes into 1 and it wouldn't matter. You could have compressed into 5 minutes and it won't matter. When a character's development causes no real net change in the way we view him aside from such flimsy and unconvincing backstory, plus the fact that the character isn't deserving of empathy, nor does the character generate any empathy, and said character has the interest of a cardboard box, it's a failure in every conceivable aspect. This barely qualifies as anything. In other words, I feel like they're better than this. ^ Yeah, everything you said sounds right to me. next arc please!! there will be lots of Nako... yay! I realize that the movie was a colossal failure, but…. I believe that Enishi did several important things in these last two episodes. He escaped his sister’s shadow, his mother’s cool indifference and her decision to let go of the past and her dream of Satsuki running the Inn, and finally made Takako explicitly aware of their mutual feelings for each other. The pool scene was important for that reason alone. I also like that Yuina came to help Kissiuso when she became aware of the scam. I liked her tact in not mentioning to the oblivious Ohana that there was a con being run. The bow that beanman and Yuina shared showed that her discretion was appreciated. This was my expression throughout the entire episode. The more I watch, the more I understand that out of all the characters, Minko's the only one I really like because she's got the most down to earth, mature, realistic attitude and can actually see when something makes no sense or is just pointless. Her and Tomoe both. This ep was just a pain to watch (except when Ohana got shot). Enishi makes a huge mistake, he nearly mans up when he talks to Satsuki, but minutes later is desperate to get under that other woman's pants. Terrible. Just plain terrible. On the other hand, Satsuki's winning more respect from me. I do like how she called Kissuiso to tell them of her suspicions. She's started to care a bit more about what goes on around there. I wonder if Yamak... I mean Jiro's 40 page script which he toiled for will be of any significance. It won't. Nothing he ever does is significant. But is it a good message? And is this episode's message one that flows well with the overall idea of "loving your work" that was said to be a core driving idea within this anime? The most predictable way to show growth in Enishi's character would have been to have him succeed at something big. This is kind of like saying "The most predictable way to satisfyingly end this shonen series is by having the main hero take out the big villain in a classic one-on-one pitched combat". Just because it's predictable doesn't make it bad. Nor does it make the exact opposite the right or smart move. I doubt many Bleach fans, for example, would be happy with the series ending on the note of Aizen absolutely destroying Ichigo, and going on to achieve all his goals (The End!). Sure, you'd have a few people celebrating how "bold and daring" it is, but most passionate fans of the show would loath it to pieces, I'm sure. The message there being that the ability to take charge and succeed is the barometer of personal worth and maturity. Which, frankly, is a practical message and applies in the real world. It's one very nicely conveyed by the excellent anime character in your cool avatar and sig. I'm going to be a bit blunt here, and I apologize if it offends anybody, but I think that it needs to be said - In a medium that frequently glorifies NEETs and Hikikomoris, having a show that takes a much more practical and realistic approach to work and adult life in the real world is something that I appreciated. It's something that I liked a lot about Hanasaku Iroha. Hanasaku's idea of "loving your work" is one that I think the anime world would benefit from seeing conveyed. I would argue that part of "loving your work" is actually becoming good at it; maybe not great, but at least generally competent. But the message of "It's Ok if you're completely and consistently inept at your work (as long as you admit to that)" is just more of the same sort of easy acceptance of social maladjustment and/or occupational failure that I see too often in anime. The fact is that guys like Enishi and Jiromaru would likely be close to self-destruction if in the real world. Enishi has likely cost himself the inheritance of the Inn as a price for his failure, and unlike his sister and niece, there's not many practical work options I can see for him outside of inheriting the Inn (i.e. he needs this a lot more than Satsuki or Ohana does). Jiromaru is one small step away from being homeless, even in this anime. As for Takako, I'd honestly like to know how she's earning a living (I doubt Enishi is paying her much, or she wouldn't have turned on him so easily in this episode). Instead, the episode suggested that the way you deal with failure is more reflective of character than your ability to create success. The way to deal with failure is to learn from your mistakes and to gradually get better at what you failed at (or to try something different and succeed at that). So if this was Enishi's first sign of failing at something, then it could be an excellent means of character growth for him. But it's not, as it's just the latest (and biggest) in a long string of failures for the guy. And the fact is, this was his character arc. If there was any time for Enishi to shine, this was it. The chances of him bouncing back from this in any concrete way is slim, imo. It could have been better executed, but I don't think the intent behind the episode was misguided. I respectfully disagree with you. I think the intent behind the episode is somewhat contradictory with what the anime as a whole is about (from what I recall reading on this board and elsewhere), and it clearly does nothing to improve Enishi and Takako in the eyes of many of us, whereas a different intent may very well have achieved that. Here is a case where the predictable approach would have been the best approach, imo. But other than the ability to man up, what else does Enishi got going for him? He's a failure at everything he does and his sister is far better than him. They ham fisted this point really hard, plus having him act like a bumbingly fool around Takako didn't help either. Totally agree. Couldn't have said it better myself. I don't think you have to be good or even halfway decent at anything at all to be a good character in a story. I somewhat disagree. A character that fails at everything (including things like friendship, romance, etc... not just practical skill or talent-related things like sports and careers) is not a character that I'm interested in. The key element to "lovable loser" is the "lovable" part (i.e. a charming personality, say). A protagonist should have at least some redeeming character traits, in my opinion. What's Enishi's? That he admits to failure when he fails? I'm sorry, but that's not enough in and of itself, in my opinion. The situation is exacerbated by the fact that while one lovable loser can usually work (I'm thinking of Sunohara in Clannad here at the moment), three or more of them (as Hanasaku aims to have) is really pushing it, imo. I agree that you can be a failure or lack redeeming qualities to be a decent character. As far as protagonists are concerned, I disagree. 100% comedic villains is about the only character type that can get away with a complete lack of redeeming qualities, imo. Ano Hana is a good example of having pitiful characters that work. 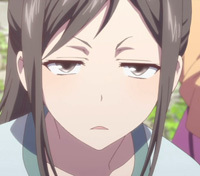 None of Anohana's characters are "pitiful". No, not even 'Manma'. Yukiatsu works precisely because he appears to be highly successful and 'with it'. Hence, his major hidden weaknesses and flaws serve as a great contrast to his outward image of the successful and popular high school student. Jinta and Poppo have some knocks against them, but both are given moments to shine, and that helps immensely for both. Last edited by Triple_R; 2011-07-25 at 10:27. It's interesting that some people felt that Enishi claimed responsibility for his actions. Watching the episode that I didn't receive any sort of impression of that at all. Everytime Takako tries to tell him it's his fault, he brings it back to a "we". It's as if hes afraid of the responsibility. Enishi was the one in charge, he was the one who had full control over the situation. He was the one who screwed up. And yet, even with the conversation with his mother, he takes full responsibility for Takako? This makes no sense to me. It's as if his mother is telling him it's not his fault but the fault of the "evil" woman beside you. Enishi needed to take a punishment for his actions, not Takako. The impression I received was Enishi didn't learn anything. It seems as if he's still incapable of coming to his own conclusions and uses others as a crutch. This episode felt like it was trying to go somewhere and never did. Last edited by Foreshadow; 2011-07-25 at 14:44. Foreshadow already said what I wanted to say regarding Enishi taking responsibility. I don't hate Enishi. I sympathize with him, even pity the poor guy. But he didn't accept responsibility for the debacle in any significant way. He didn't even accept the fact that it was his signature on the contract. That Takako was only an advisor - the final decision was his. He didn't accept that good intentions - which, yes, Takako had - just aren't enough. How? He nearly hit Takako when she pointed out how hung up he was on his sister, and his mother nearly proposed the position of heir to her, right in front of him. He hasn't escaped anything. Perhaps, complete is too much. But what about bad traits overwhelming the good so that it's hard to really take the redeeming qualities seriously like our poor Einshi before this episode? I don't understand why redeeming qualities are prerequisite to having a good character. Sometimes, you can make a good story by having a failure of a character learn from his mistakes or gain some redeeming qualities. Or least try. Some may argue that if they eventually do grow into better characters that the redeeming quality was there all along, but I reject this kind of thought, because it takes away credit from them in earning said development. The anime Kaiji is a good example of someone who is utterly pitiful, selfish, and pathetic, but the anime is about him molding to something else. Or there's the whole bunch of so called "anti-heroes" that lack redeeming qualties but are intresting characters in their own right. Asuka Langley Soryuu from Evangelion most certainly has competent traits, but she's utterly terrible as a person and arguably rotten to almost the core. But her character works because of the circumstances that surround her. Essentially, a bad character is someone that not only lacks redeeming traits but is poorly justified, weaknesses are for comical reasons, and empathy is requested (obviously ending in failure) Any good things about them are typically only on paper. Basically, the female lead of Ore Imo. Einshi is like that, just much less obnoxious. Does he learn? On paper yes. Do we care? Probably not. I dunno... I tend to remember Yukiktsu's flaws more. I like Yukikatsu's character. As a person, eh... I can't say I like him very much. As for Jintan, he would be regarded by many as a complete loser just because he could not get on with his life and just did nothing with it. But at face worth, while everyone thinks he is such, it's his friends and eventually the audience that views his growth into an actual person. But at the start, he really is selfish, apathetic, and unable to do anything. But within a few episodes, he proves that he is a much better character than any of the Hana Iro cast save for Ohana, because well... they gave a damn! He's... actually a person. My main concern is for characters to be human. And some people are seriously flawed; that's fine. Einshi... I'm not sure what he qualifies as, but to me he's more of a cardboard prop for comedy. Same goes for Jinomaru. Last edited by Archon_Wing; 2011-07-25 at 15:17. Well, that ep was a bit of a let down. For the moment I will give it the benefit of the doubt and hope that the ... err ... rather uninspiring threads laid down in this episode will be used towards the end in an unexpected way that will wow me. At least I hope it does. Otoh maybe this is a good sign in the sense that hopefully the show can only go "upward" from here! At least I hope it is. All times are GMT -5. The time now is 01:33.